Real, Genuine Liquid Zeolite is ONLY sold in a blue-labelled bottle. Genuine Liquid Zeolite Micronized Cleansed Activated - Each Bottle is a 1 Month Supply. 100% Safely Removes Mercury, Cadmium, Heavy Metals, Chemicals and Toxins Fast. Our Liquid Zeolite is advertised on hundreds of syndicated National Radio Talk Shows. Our Liquid Zeolite Enhanced with DHQ is one of the most important supplements you could ever take! 17,000+ Testimonials & Positive Feedbacks! Proven Formula – Proven Results! Most customers say that they feel happier, healthier, more energetic, have clearer sharper thinking, smoother softer younger looking skin, etc! Many customers report amazing testimonials that we can’t even repeat! Overweight buyers say it helps suppress their appetite and very sickly buyers say it improves their appetite! Buyers also mention that their bowel movements are more normalized as well. Customers tell us their doctors say “I don’t know what you're taking, but whatever it is keep it up”, so they keep taking our Ultra Liquid Zeolite, and their health continues to improve! Liquid Zeolite is effective at removing heavy metals, mercury, toxins, etc. Liquid Zeolite alkalizes the body (pathogens can’t live in a balanced PH environment, most diseases occur when the body is acidic. An acidic body is a sickness magnet! Get Alkaline & Get Healthy! Our Liquid Zeolite is recommended and sold by physicians, chiropractors and healthcare practitioners worldwide! It is for cellular repair & defense! Great for children and pets too! Liquid Zeolite will Detoxify your body of these toxic heavy metals. Lead, cadmium, mercury and arsenic and more are widely found in our environment and are known as toxic metals. We are exposed to these toxic metals from numerous sources today, including contaminated air, water, soil and food. Lead weakens the body severely. It replaces calcium in the bone, weakening them and slowly causing one type of osteoporosis. Lead is incorporated into bone, causes the bio-unavailability of calcium and displaces calcium. Lead inhibits enzymes associated with hemoglobin synthesis, and increases the rate of destruction of red blood cells. It also replaces calcium in the blood cells, damaging the blood. Lead can raise uric acid levels and impair kidney function leading to gout. Mercury is among the most toxic elements known to man. It is also the most common heavy metal on the earth today. That is why having mercury fillings is such a major challenge to your health. Mercury is found in many prescription and over-the-counter remedies, dental fillings and vaccines. Hundreds of symptoms may be due to chronic mercury toxicity. It often settles deep in the tissues of the brain, kidneys and liver. Cadmium is a very toxic metal and is associated with the development of cancers. Cadmium also powerfully irritates adrenal activity. Cadmium is among the most toxic of the heavy metals. It is a common metal found in marijuana, cigarette smoke, tap water, coffee, some processed and refined foods such as hydrogenated oils, and in foods from the sea, especially shellfish. Cadmium is extremely toxic, with acceptable levels one tenth that of most of the other toxic metals. Its effects are many, but it mainly affects the kidneys, the cardiovascular system, and is related to cancer. Arsenic is a very toxic mineral. Arsenic poisoning is extremely common and affects most people today, to some degree. Arsenic is a left-side poison, affecting the heart and the left side of the brain. Arsenic is added to salt. Many herbs are contaminated from soil and water. Many lakes are contaminated with arsenic which poisons the fish. Arsenic is also found in beer, wine, rice and butter. It is used as pesticide on fruits and grapes. Arsenic is a powerful enzyme poison and disrupts the adrenal glands. Avoiding aluminum ingestion altogether is literally impossible. That’s because aluminum is one of the most abundant elements in soil. So anything that grows from the ground–or eats things growing from the ground– contains aluminum. You get the idea: There is no food containing zero aluminum. Liquid Zeolite doesn't release or leach any aluminum into the body, it attracts and removes aluminum, mercury, heavy metals & toxics found in the body. TO ORDER LIQUID ZEOLITE-- SCROLL DOWN TO BOTTOM OF PAGE.. Liquid Zeolite Enhanced with DHQ removes heavy metals such as: lead, mercury, arsenic, cadmium, and other toxins from the human body without affecting vital levels of essential minerals like calcium, magnesium, or zinc. The natural zeolite powder used in our Liquid Zeolite is thoroughly cleansed to clean-out the zeolite cages of any possible naturally occurring contaminants leaving us with a totally safe & clean zeolite powder to work with! 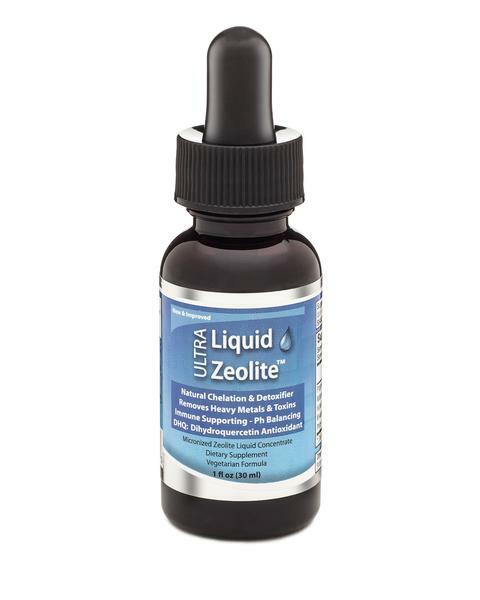 Liquid Zeolite Company Inc. only manufactures in the USA. Plain zeolite powder ONLY works in the intestine while Liquid Zeolite (micronized cleansed zeolite combined with humic acid/fulvic acid) is transported throughout the 60,000 miles of blood vessels in your circulatory system. It starts to detoxify ALL of your body’s cells in seconds! Liquid Zeolite is the most advanced zeolite liquid you can buy! Liquid Zeolite contains ultra-micronized zeolite particles with an average size of less than ½ micron (one micron is one millionth of a meter), which is many times smaller than most other competitor brands of zeolite liquid supplements' particle sizes. The great importance of such a smaller particle size is that it yields a considerably greater overall zeolite surface area, which allows a significantly greater number of it’s "microscopic crystalline cages" to be exposed, thereby increasing the zeolites' ability to absorb mercury, cadmium, other heavy metals and toxins more efficiently & effectively. There are 15 key reasons why Purified Activated Liquid Zeolite Enhanced with DHQ is the most unique and extraordinary food supplement on the market today! Extremely safe and non-toxic: Purified Activated Liquid Zeolite is completely non-toxic and is safely and completely eliminated after 5 to 7 hours. Toxins that it captures in its cage are effectively deactivated so that there are no side-effects from those toxins as they are eliminated from the body — it is important to drink plenty of water (8 to 10 glasses a day) when taking zeolite. And because most pharmaceuticals drugs are negatively charged chemicals, Purified Activated Liquid Zeolite tends to leave these alone. Removes toxic heavy metals: Purified Activated Liquid Zeolite has the perfect molecular structure for latching on to and then removing heavy metals (including radioactive ones) from the body, including mercury, cadmium, lead, arsenic, aluminum, strontium and excess iron. Helps remove pesticides, herbicides & dioxins: These chemicals are prime candidates for triggering cancer and disrupting hormone balances, it is very important that they are removed from the body as quickly as possible. Reduces viral load: Purified Activated Liquid Zeolite latches on to viral components. This can help relieve some of the symptoms of viral diseases and infections. Reduces absorption of nitrosamines: These substances can be found in processed meats, bacon, hot dogs, deli meats, etc. and are linked with pancreatic, stomach and colon cancer, as well as Type II diabetes. Purified Activated Liquid Zeolite helps to neutralizes these toxins in the digestive tract by capturing them in its molecular cages before they can be absorbed into the body. Then they are safely eliminated from the body. Helps buffer body pH to a healthy alkalinity: Purified Activated Liquid Zeolite acts like a pH buffer, helping to prevent the acidic conditions in our blood and cellular fluids that encourage low immunity and diseases. Helps to buffer blood sugar: it can also buffer excess glucose by its negative charge and therefore helps reduce blood sugar spikes. Helps reduce cancer risk: Purified Activated Liquid Zeolite removes toxins that can cause cancer (75% or more of cancers may be toxin related). Improves nutrient absorption: Purified Activated Liquid Zeolite also helps reduce the incidents of diarrhea, which is why zeolites can now be found in the latest diarrhea drugs. Acts as a powerful antioxidant: The cage-like structure of Purified Activated Liquid Zeolite can also trap free radical molecules, making it an effective antioxidant. Reduces symptoms of allergies: Purified Activated Liquid Zeolite can capture some of the the antigens that cause allergies, migraines, and asthma, and in so doing it helps to reduce the symptoms. Immune modulator: may act as an effective "natural" immune modulator. It could effectively regulate an underactive or overactive immune system back to normal. Most diseases and illness occur when the immune system is unbalanced! Helps prevent premature aging: By removing the toxic load with Purified Activated Liquid Zeolite, our body's normal repair and regeneration mechanisms are freed up to work efficiently. Extremely easy and pleasant to take: NO MESSY POWDERS to deal with! Most serious detox solutions are difficult to take, taste unpleasant, and can leave a person feeling drained because they indiscriminately remove healthy minerals as well. Purified Activated Liquid Zeolite is a small bottle of tasteless liquid that can be taken with or without food and that removes only unhealthy ions. Contains Dihydroquercetin (DHQ), also known as taxifolin, which is a bioflavonoid similar in structure to that of quercetin. Almost 600 studies conducted over the last 50 years have investigated its effectiveness and safety. Flavonoids perform two important functions... they strengthen your body’s immune response and they act as powerful super-antioxidants. Flavonoids have been reported to have antiviral, anti-allergic, antiplatelet, anti-inflammatory, anti-tumor and antioxidant activities. $10 Flat Rate Shipping Worldwide! PLEASE Order online if Possible! EMAIL us if you have any trouble ordering online, LiquidZeolite@AOL.com We are open everyday from 10:00am to 8:00 pm eastern time. Order online and receive a coupon for a deep discount on your second order! It is safe to use: Liquid Zeolite comes from the only ore supply that's been approved as safe for consumption by humans. In addition, it has been processed in such a way that it can NEVER withdraw necessary minerals or elements from your body only the harmful ones. In fact, it actually helps to remineralize your cells. It is chemical free: Liquid Zeolite is processed without chemicals. Through a natural, proprietary process, concentrated organic humic acid molecules naturally hold zeolite in permanent suspension. The natural zeolite powder used in Liquid Zeolite is ultra-micronized & it's zeolite cages are thoroughly cleansed. Finally the finished Liquid Zeoliteproduct is gently heat-pasteurized to assure a 100% safe liquid zeolite formula. It has maximum bioavailability: Because the humic acid in Liquid Zeolite is organic and because the zeolite is actually suspended in the humic molecules, 100% of Liquid Zeolite is carried into the cells, making it much more efficient than other zeolite liquid products on the market. It has anti-aging properties: Because Liquid Zeolite uses natural humic acid to carry the zeolite to your cells, the anti-aging properties of organic humic acid "come with." There is no substitute for organic humic acid to revitalize our cells and reverse cellular degeneration. What makes natural cellular Liquid Zeolite better than other major brands of liquid zeolite? Many other brands use chemicals, solvents and/or high-heat treatment methods to process their zeolite into a liquid form. Natural Cellular Liquid Zeolite utilizes the newest most advanced proprietary natural manufacturing processes. The multi-level marketing company (MLM brand) uses high-heat treatment methods and harsh chemical reagents such as hydrochloric acid and/or acetic acid in their manufacturing process. Buy Liquid Zeolite and Get Healthy Fast! Perfect for men, women, children & pets! Zeolite: natural zeolite mineral, world’s greatest detoxifier, heavy metal and toxin remover! Oxygen: disease killing oxygen and energy enhancer, feel more alert & energetic without drinking caffeine! Dihydroquercetin (DHQ) bioflavonoid powerful super-antioxidant: strengthens your body’s immune response to attacks from viruses, allergens, and carcinogens. Flavonoids have aroused considerable interest recently because of their potential beneficial effects on human health, they have been reported to have antiviral, anti-allergic, antiplatelet, anti-inflammatory, antitumor and antioxidant activities! M-Water: which helps to super-hydrate your cells and enhances the permeation of zeolite into your cells and toxins out of your cells! Minerals: 72 natural ionic angstrom-sized trace-minerals for cellular repair & cellular regeneration, may help slow, reduce or reverse aging. Revitalize your body with minerals usually lacking from your diet. Experts estimate that 90 percent of Americans suffer from mineral imbalance and deficiency. Most trace elements need to be in ionic form to be well absorbed in the intestine.” —Alexander G. Schauss, Ph.D.
pH: may help regulate/balance your body's pH to a more alkaline level. Because most diseases & illnesses occur when your body is acidic, become more alkaline and become more healthy, period! Immune modulator: may act as an effective "natural" immune modulator. It could effectively regulate an underactive or overactive immune system back to normal. Most diseases and illness occur when the immune system is unbalanced! We start with the purest cleanest zeolite on the planet, mined specifically for human consumption. The natural zeolite is specifically prepared with a proprietary cleansing process to ensure thoroughly cleansed zeolite cages and standardized cation capacity. The zeolite is then put through thorough quality control tests to ensure its quality and safety is maintained for specifically for human consumption. It is thoroughly dried and then MICRONIZED to average particle size less than ½ micron, much smaller than a human blood cell, thus allowing it to readily travel throughout the human body to effectively & efficiently remove dangerous toxic heavy metals such as mercury, cadmium, lead, arsenic, nickel, barium and other toxic chemicals and toxins. Dihydroquercetin (DHQ), also known as taxifolin, is a bioflavonoid similar in structure to that of quercetin. Almost 600 studies conducted over the last 50 years have investigated its effectiveness and safety. Flavonoids perform two important functions... they strengthen your body’s immune response and they act as powerful super-antioxidants. Flavonoids are polyphenolic compounds that are ubiquitous in nature and are categorized, according to chemical structure, into flavonols, flavones, flavanones, isoflavones, catechins, anthocyanidins and chalcones. Over 4,000 flavonoids have been identified, many of which occur in fruits, vegetables and beverages (tea, coffee, beer, wine and fruit drinks). The flavonoids have aroused considerable interest recently because of their potential beneficial effects on human health-they have been reported to have antiviral, anti-allergic, antiplatelet, anti-inflammatory, anti-tumor and antioxidant activities. Flavonoids may help provide protection against these diseases by contributing, along with antioxidant vitamins and enzymes, to the total antioxidant defense system of the human body. Epidemiological studies have shown that flavonoid intake is inversely related to mortality from coronary heart disease and to the incidence of heart attacks. Antioxidants are compounds that protect cells against the damaging effects of reactive oxygen species, such as singlet oxygen, superoxide, peroxyl radicals, hydroxyl radicals and peroxynitrite. An imbalance between antioxidants and reactive oxygen species results in oxidative stress, leading to cellular damage. Oxidative stress has been linked to cancer, aging, atherosclerosis, ischemic injury, inflammation and neurodegenerative diseases (Parkinson's and Alzheimer's). Liquid Zeolite is the NEWEST method to deliver zeolite to the cells. A proprietary, organically induced, advanced technology is used to absorb the natural cellular zeolite directly into the molecular structure of the humic mineral complex. The zeolite mineral molecule is ingested by the humic mineral complex, producing a highly stable and suspended potent bioavailable cell-penetrating supplement. NO CHEMICALS, NO HARSH CHEMICAL REAGENTS & NO SOLVENTS USED. Combining natural cellular zeolite with humic minerals, delivers a powerful natural chelating, pH balancing, immune supporting and remineralizing vitality supplement. What makes Zeolite so unique is its negatively charged, cage-like, honeycombed structure. When ingested, this natural mineral attracts and irreversibly binds toxic heavy metals, chemical elements, and free radicals and is then excreted through the urinary tract. This process is called Chelation. One of the most significant benefits of Zeolite over other chelating agents is its affinity schedule for toxic heavy metals. Zeolite binds with mercury first and lead second, moving on to additional positively-charged toxic heavy metals and chemical toxins which may include pesticides, herbicides, plastics, and even radioactive particles without removing precious nutrients such as calcium and magnesium. However, Zeolite goes far beyond the critical job of removing damaging toxins. Research has shown that it has many other vital actions in the body. Zeolite removes free radicals. Unlike classic antioxidants, Zeolite does not neutralize free radicals by donating an electron to stabilize them. Instead, its structure captures free radicals. Once trapped inside the cage, the inactivated free radical can then safely be eliminated from the body. Viruses. Those enigmatic, perplexing and often lethal microbes cause a vast number of human illnesses from the common cold, to cancer to epidemic diseases. New and changing viruses are appearing at an all too alarming rate and we need an effective way to control their influence on our body. Referred to as the “missing link” to optimum health and nutrition by leading scientists throughout the world, humic acid is a health miracle. Medical studies now show that it has the ability to significantly change our life for the better. It is so safe, powerful and effective that it has been used around the world for hundreds of years with amazing results. Human dietary supplementation with humic acid is bringing about life changing results for so many! Humic mineral complex is the smallest, most complex, most highly refined naturally occurring water-soluble substance on earth. It is an all-natural substance that has been extracted from ancient deposits of organic matter. It is refined for human use as a dietary supplement. Tiny amounts remarkably transform the molecular structure of water, making it intensively more active and penetrating. Humic acid mineral complex then assists water in its job of dissolving and transporting. LIQUID ZEOLITE contains natural purified clinoptilolite zeolite which has been ultra-micronized and ultra-cleansed, humic acid, fulvic acid, DHQ (dihydroquercetin), M-Water "structured water", 72 naturally occurring trace minerals, 12 naturally-occurring amino acids, phyto-nutrients, macro-nutrients, and micro-nutrients. Potassium sorbate and citric acid added as natural preservatives. Each batch is also 3rd party-lab tested to assure a 100% safe product. - If you are pregnant, nursing, taking medication, or have a medical condition, consult with your doctor before using this, or any other supplement. The statements enclosed herein have not been evaluated by the Food and Drug Administration. The products and information mentioned on our websites or printed literature are not intended to diagnose, treat, cure, mitigate, or prevent any disease. Information and statements made are for education purposes and are not intended to replace the advice of your treating doctor. We do not dispense medical advice, prescribe, or diagnose illness. Benefits of non-Rx, dietary supplements VARY from person to person. Do not take if you are pregnant or nursing. If you are taking medication or have a medical condition, consult with your doctor before using any supplements. Your information is NEVER shared nor sold to ANYONE else. We will NOT contact you by phone, unless we have a issue with your order. We do NOT store any credit card or phone numbers. Any phoned-in, written orders, once processed, are shredded for your privacy. Prices subject to change without any prior notice. ***Disclaimer*** The FDA says ONLY a drug can treat, prevent or cure a disease, Liquid ZeoliteÔ is NOT a drug. We make NO MEDICAL CLAIMS or CURE CLAIMS for the product.